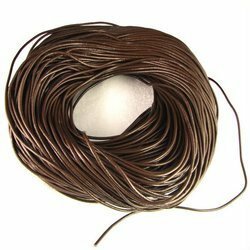 We manufacture and supply an exhaustive range of Leather Cords which include braided leather cord, round leather cord, flat leather cord, barbwire leather cord, jewellery leather cord, suede leather cord and bolo leather cord. 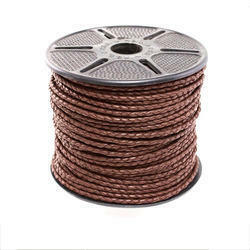 These cords are of heavy duty and have high durability. We also provide customized solutions in terms of size, thickness, colours and designs for meeting the special requirements of our customers. 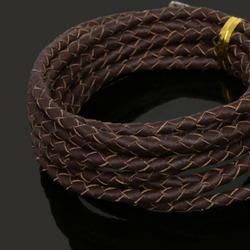 High quality leather cords are available in variety of plain & braided colours. The length and designs can be manufactured as per buyer’s choice & specifications. Our leather cords are made from genuine leather such as cow, sheep, buff, goat, etc. Leather cords are available in colour choice of white, black, tan and brown. Our exclusive range of Leather Cord for the varied requirements of our clients. 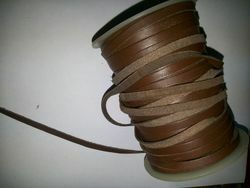 Our clients can avail from us an extensive range of Leather Flat Cord. 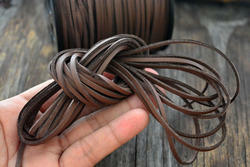 We are offering a wide range of Flat Leather Cord. 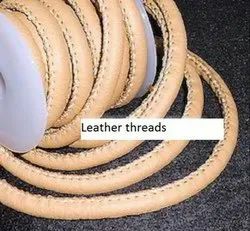 We are an eminent manufacturer of Pure Flat Leather Cord offering unmatched quality and unique appearance. Our Flat Leather Cords are available in different dimensions and colors and can also be customized as per our client's requirement. We manufacture these flat leather chord from finest leather and are known for durability and attractive designs. 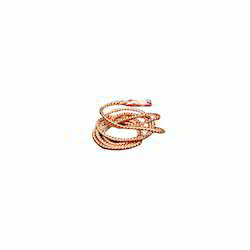 These laces at Highly competitive prices as per the demands of our clients. From the past couple of years, we are engaged in offering our clients an exclusive range of Bolo Leather Cord. Their uniqueness lies with their universal blending qualities. 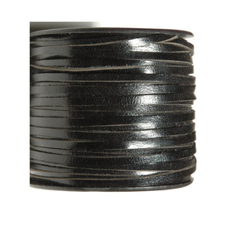 As per the needs and requirements of our clients, we are involved in providing Jewellery Leather Cord. As per the needs and requirements of our clients, we are involved in providing Suede Leather Cords. 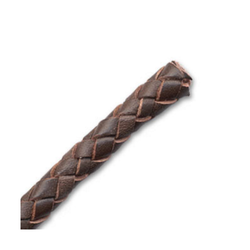 We offer Braided Leather Cord in various sizes and colors like brown leather braided cord. The braided leather cord can easily be sewn in different unique styles, as they are manufactured using soft, subtle and luxurious leather. Thus, these chords find application for making jewelry like bracelets, earrings and other precious articles. They are also used for multi-functional purposes such as to keep the sunglasses in place when being active, apparel accessories like belts etc. The use of braided leather cord in garments creates an image that is refined yet stylish and suitable for every occasion. 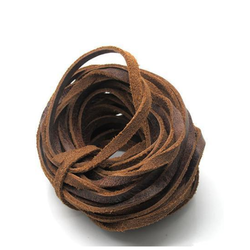 We offer real Suede Leather Cord that are used in sneakers, boots, skates and other shoes. Durability and excellent finish are some of the prominent features of our pure suede leather cord. Our suede leather chords are also used as accessories in making of jewelry, garments, key chains, etc. This range is manufactured from finest leather and is known for attractive designs. We offer them in varied dimensional specifications to suffice the needs of bulk buyers. 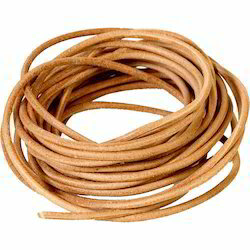 We manufacture an extensive range of Buff Leather Cords that find application in the garment industry. The use of buff leather in the manufacturing process ensures durability and strength. We meet the requirements of garment and handicraft sectors, as these cords are used for making jewellery and embellishing garments. We offer tailor made chords in different thickness, designs and colours etc. 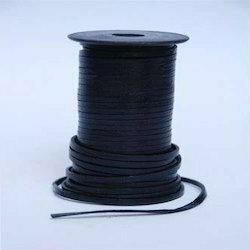 We manufacture and supply an exhaustive range of Leather Cords which include braided leather cord, round leather cord, flat leather cord, barbwire leather cord, jewelry leather cord, suede leather cord and bolo leather cord. 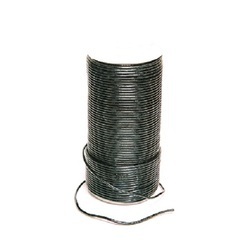 These cords are of heavy duty and have high durability. We also provide customized solutions in terms of size, thickness, colors and designs for meeting the special requirements of our customers. 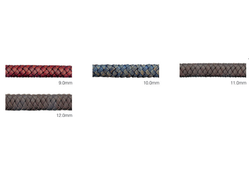 High quality leather cords are available in variety of plain braided colors. The length and designs can be manufactured as per buyers choice specifications. Our leather cords are made from genuine leather such as , sheep, buff, goat, etc. Leather cords are available in choice of White, black, tan and brown. High quality leather cords are available in variety of plain braided colors. The length and designs can be manufactured as per buyers choice specifications. Our leather cords are made from genuine leather such as cow, sheep, buff, goat, etc. Leather cords are available in color choice of white, black, tan and brown. 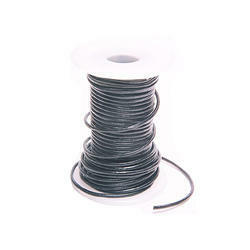 Our company holds vast experience in this domain and is involved in offering Barbwire Leather Cord. 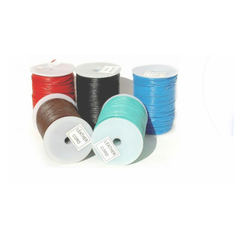 We manufacture an extensive range of Buff Leather Cord that find application in the garment industry. 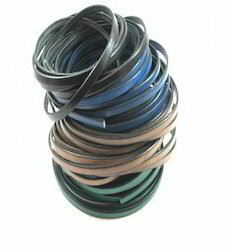 As per the needs and requirements of our clients, we are involved in providing Natural Color Leather Cord. Shivam Narrow Fabrics is well known for their Round Leather Cord which is Perfectly cut leather shaped in rounded form. 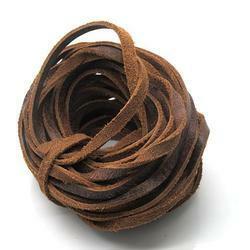 We are one of the prominent manufacturers of an extensive range of colorful Round Leather Cords. Use of finest leather ensures durability and gives an inexplicable look. We offer an array of chords in metallic colors and in dyed colors like black, brown, white, red, blue, etc. known as metallic round leather cord. Availability in wide array of shades compliments any fashionable accessory. 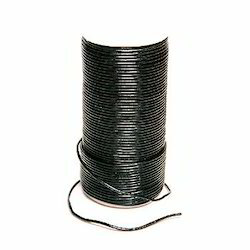 These round leather cords are available in various diameters, finishes, sizes, etc., and can be customizes as per client's requirement. We manufacture and export an exclusive line of Leather Flat Cords with high aesthetic appeal. 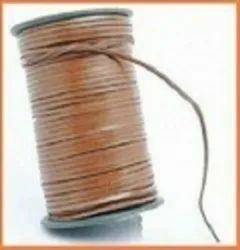 We are one of the most trusted Barbwire Leather Cord manufacturers in India. These Leather Cords are made of two leather strands of equal diameter and can be availed in many colors like black, pearl white, sky blue, red, etc. Additionally, our clients are eased with the availability of the Barbed Wire Leather Cord in different dimensions and patterns as per the specifications provided. 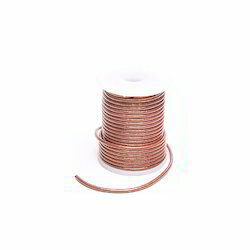 Usually used for making leather jewelry like necklaces, chokers, bracelets, anklets, etc., our range of wires are soft to touch and comfortable to wear. We are highly acknowledged organization engaged in presenting a remarkable range of Suede Leather Cord. 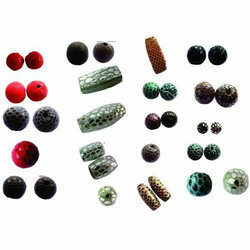 We are one of the leading manufacturer, supplier and exporter of Leather Beads in Mumbai, Maharashtra, India. These are made using quality leather and are appreciated for its matchless design, impeccable patterns and excellent quality. Available in various sizes and dimensions, these can be custom-made as per the client’s requirements. 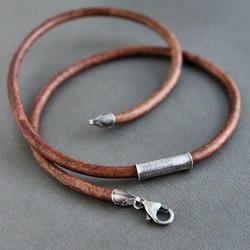 The range of Jewelry Leather Cords offered by us is designed in line with the latest market trends. Our exclusive range encompasses Imitation Leather Cord, Pearl Leather Cord, Gold Leather Cord, Leather Neck Cord and Leather Cord for Jewelry. These chords are widely used in attractive jewellery like bracelets, necklaces, ear-rings, ties and stringers. They can be availed in an array of colors like white, beige, yellow, gold, brown, orange, red, burgundy, turquoise etc. Available in many finishes such as oil dye, stain etc, we use only fine quality leather that ensures uniformity, color fastness, and permanent flexibility. We are one of the leading manufacturer, trader & exporter of Leather strips in Mumbai, India.Leather strips are durable and can be used for stringing and braiding, they are also effective used alone with just a pendant hanging from it and also in footwear accessories. We offer leather and suede cords in a wide variety of colours, as well as various thicknesses. Leather and suede give you that classic, cool look resulting in stunning pieces of jewellery. We are one of the leading manufacturer, trader & exporter of Leather Threads in Mumbai, India. Our range of Leather threads is used to stitch and manufacture leather bags, boxes, sports covers, buff rolls, saddles and other products. The extensive array of our company is offered in brown, cream, white, black, maroon and yellow colors. 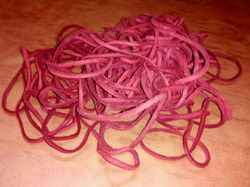 Looking for Leather Cord ?